Moving into a new and more spacious classroom this year has been good in so many ways. One of the few downsides is that I had to leave the little garden that I had built with my students over the last 3 years. Today, we began a new garden right outside our back windows. For the majority of the time we were working, we were moving bricks and rocks that I'd used to build the old garden. (Since I helped the kids carry those rocks and bricks, I didn't really get any photos.) 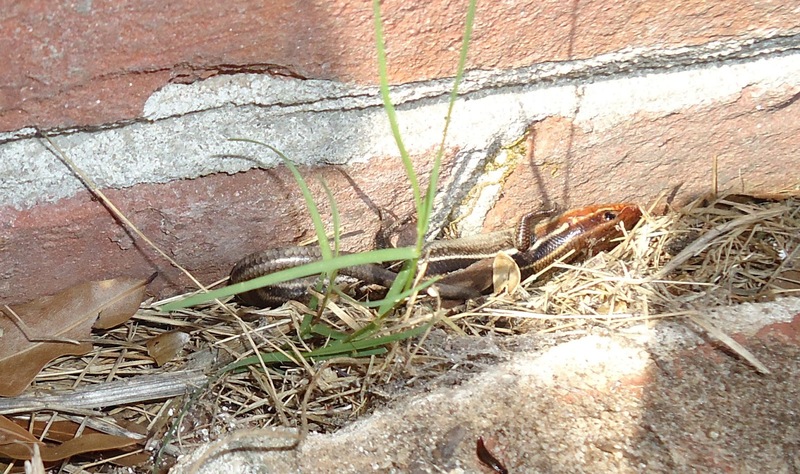 While we were moving the bricks from the pold garden, we uncovered a little skink. He was fat and happy and had made his home there. He came out for a while and we got a good look at his blue tail, but by the time I got my camera, the children had given him pause and he was more cautious. After we removed our materials, we left him there to continue to live in that rich little patch. After we got all the bricks and fencing, we laid out where we wanted the garden to be. The children were eager to get started. I explained that we had to clear the patch before we could start any planting. The ground is very hard and not very rich. We need to turn it a bit and maybe add a little rich soil. (note: I should probably disclose at this point that I am NOT a gardener. I know absolutely nothing about gardening and kill every plant I pass, real, silk, plastic or otherwise.) The first year I made a garden with the kids, we used toy or kids' gardening tools. They broke within the first few days. Eventually, I've collected a few real gardening tools and I very carefully supervise use. I had to practically drag the kids indoors when it was time for lunch. They really enjoyed working in the garden. I went out for a few minutes this afternoon while they were in aftercare, and they were begging to "do some more work". We will be clearing this area for the next few days. I'd like to get plants going before we go on Spring Break in a week, so the children will see some seedlings before our school year is over in just a few more weeks. I think this will be a fun way to spend some of our outdoor time, now that the weather is so beautiful. "Do some more work"... children do love it when we take them seriously and include them in real jobs. Long may it last! And Ayn, when the term's over and the kids have a bit of a break, dig some well-composted manure into that garden. It will make it ever so much more rewarding when the kids plant something. This sounds absolutely wonderful! I have plans to start a garden with my twin sons who are 4 years old. I ordered a Curious George themed Farm Terrarium where you can grow your own tasty tomatoes, while you cultivate grass. This will serve as an introduction to gardening/science. My husband and I are also gathering materials to build our own small garden in our yard. I wanted to do this as a family and make it a learning experience for us all.